A new law to regulate home-sharing services like Airbnb hasn't discouraged Quebecers who use the website. The number of listings has more than doubled in 12 months, a CBC/Radio-Canada report shows. Airbnb's popularity continues unabated in Montreal. In all, 9,458 ads were identified on the website that allows visitors to stay in a private home rather than a hotel. The Plateau Mont-Royal borough offers the most choices: 2,919 listings are available there. 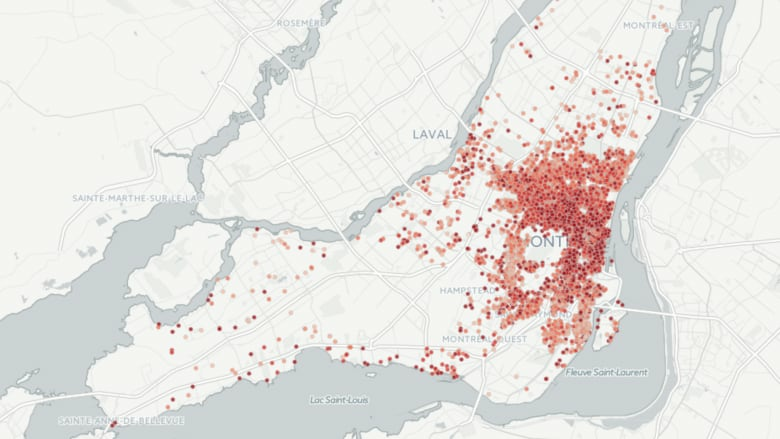 Ville-Marie comes in second (2,035 listings), followed by Rosemont-Petite-Patrie (1,204), and Côte-des-Neiges—Notre-Dame-de-Grâce (651). On a mobile device? Tap here for the map. According to Paul Arsenault, a professor of urban studies and tourism at UQAM, the arrival of a player like Airbnb has had an undeniably positive impact. "It opened up a new way to travel. The only way for a family to spend more than two days in a city, or a week or two in the Plateau, for example, is with Airbnb. And the money saved is spent in town," he said. The Airbnb data can reveal how active a host is by the number of reviews left by guests. By this measure, very few listings can be considered active users. For instance, 3,024 of them did not receive any comments, which likely means that the apartments were never rented out. Furthermore, 5,610 listings have fewer than five reviews. The club of super users, who boast more than 100 comments, are just under 60 users. Bill 67, adopted almost unanimously by the National Assembly on Dec. 1, will change the lives of regular users of Airbnb, HomeAway and other home-sharing sites. Obliging regular users to obtain a classification certificate from the Ministry of Tourism. Charging regular users a lodging tax of 3.5 per cent. Increasing the number of inspectors in Quebec from two to 18 to enforce the new legislation. However, Bill 67 does not define a "casual user" versus a "regular" one. The province did not copy San Francisco, for instance, which defined a casual user as one who rents out a home for a maximum of 90 days a year. Airbnb did not return requests for an interview for this story. The hotel industry welcomed the new law. "The same rules should apply to all players. There must be some form of equality. But we are not against this type of accommodation, because we are in 2015," said Xavier Gret of the Association Hôtellerie Québec. The law also pleased Patrick Thevenard, a bed-and-breakfast owner who battled for years against Airbnb and other home-sharing sites. He saw apartments around his business in Ville-Marie receive tourists without having to submit to any form of regulation. "We'll just have to see how the government will implement the new legislation," Thevenard said. The application of the new law, however, worries public housing groups who fear that affordable homes will be removed from the rental market and serve only tourists. This is a problem that is far from settled, according to Carole Boucher, coordinator of the Comité logement du Plateau Mont-Royal. "Yes, we have increased the number of inspectors, but is that enough for all of Quebec? And it's always easy to cut inspector jobs to save money in a new budget," she said.